This exclusive Active Naturals® formula, infused with Nourishing Wheat Complex and Hydrating Oat Protein, is designed to feed your hair - replenishing moisture as it targets the weakest part of hair - fortifying the hair shaft with protein where it needs it most. Developed with at team of experts, including a leading dermatologist and stylist, our Active Naturals® formula harnesses the power of nature combined with advanced scientific methods, and is shown to give you the beautifully strong, healthy hair you desire and deserve. And, because it's from Aveeno® you can trust that it's gentle on color-treated hair. *Nourish + Moisturize shampoo and conditioner system. 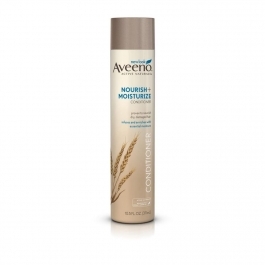 After using Aveeno® Nourish + Moisturize Shampoo, massage into wet hair and work evenly through to ends. Rinse thoroughly.